Pictured left to right: Coach John Tucker, Jon Stone, Kyle Brumels, Keven McDowell, Dylan Goodwin, Dominick Pataky, Cole Lensing, and Nathan Ford. JEFFERSON CITY, Mo. 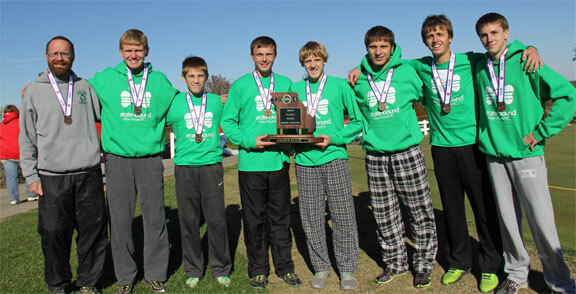 - Saturday in the Class 1 State Cross Country meet, New Haven’s boys team became the first boys team in school history to ever win a state final four trophy. BOWLING GREEN, Mo. - New Haven’s boys and girls teams are District Champions after dominating Saturday’s Class 1 District Cross Country Meet. Saturday marked the first time in school history that New Haven had both teams win district titles. 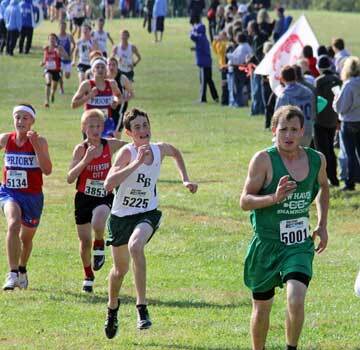 Adding the historical day for the Shamrocks, it was the first time that both teams had everyone medal at Districts by finishing in the top 15. Jefferson City, Mo. - The saying “being in the right place at the right time” is exactly how the greatest distance runner in Shamrock history was born. Saturday, in his final cross country meet, Seth Schenck caped off his illustrious career at the Missouri State Cross Country meet at Oak Hills Country Club, finishing in the top ten for the first time by taking 9th place. However, Schenck’s four straight state appearances, three All-State medals, and his Four Rivers Conference and Class 1 District Championships may have never happened if he and Cross Country Coach John Tucker were not “in the right place at the right time” over seven years ago. Jefferson City, Mo. - The goal Coach John Tucker had going into Saturday’s State Cross Country Meet at Oak Hills Country Club was for each of his kids to run their best race of the season and they did just that. 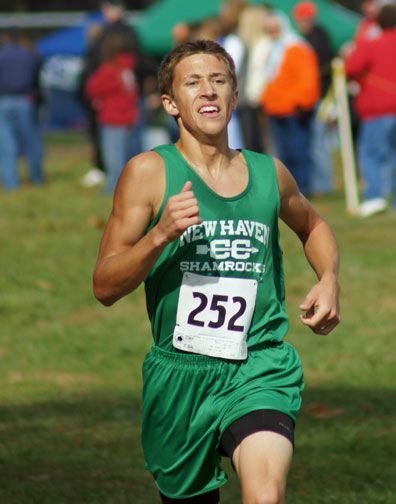 Junior Dominick Pataky won his first State Medal, finishing 17th (top 25 medal and are All-State) and ran a career best, 17:48. Senior Seth Schenck ended his illustrious cross country with a career best finish at state, taking 9th place. Westphalia, Mo. 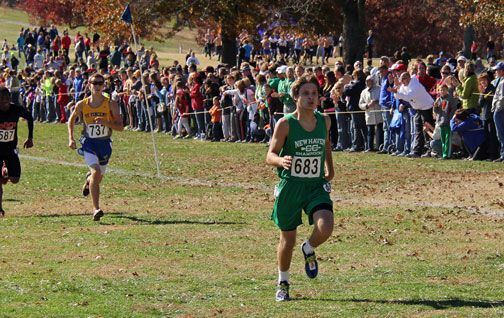 - Seth Schenck’s list of memorable performances continues growing after winning Saturday’s Class 1 District 3 Cross Country meet at Fatima High School, beating Russellville’s Alex Thompson by over 30 seconds after losing to him by one second three weeks ago at Owensville. (6th) Dominick Pataky and (7th) Zach Grater will both run at state next Saturday. Seth Schenck begins making his move as they approach the 2 mile mark. In less than 400 meters, Schenck exploded past the two Sullivan runners, taking a 15 second lead. The Sullivan boys' team took first overall. Owensville took first place on the girls side. Owensville, Mo. 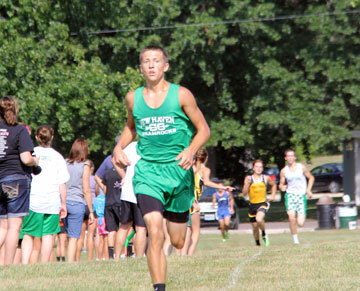 - The Shamrocks’ boys cross country team finished second, nudging past Owensville by one point in last Tuesday’s Four Rivers Conference (FRC) Meet. 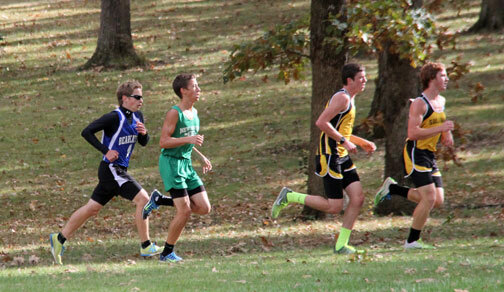 Pictured: Zach Grater holds of Rock Bridge's Jack Gabel to finish 33rd out of 124 runners. Washington, Mo. - Going into Saturday's Borgia Inventional at Big Driver, Tucker's focus was not how they'd compete as a team; running against much larger schools such as SLU, CBC, Rock Bridge, and MICDS, "It's more how did we compete on the course" said, Tucker. "Our whole mission on Saturday was to run well on a really tough course and we did." With just four days rest after running an all-time best (17:04.82) at Owensville, Seth Schenck turned around to ran a 17:09.6, finishing 10th on Saturday. Why is Schenck a beast, because comparing the much flatter Owensville course to Big Driver is like David verse Goliath. Hermann, Mo. - Tuesday, the Hermann Cross Country Inventional began with Abby Grater taking second place in the middle school girls race. The middle school boys team won their first race on the year, led by Nathan Ford's taking second and Ryan Blankenship (9) and Kyle Brumels (10) both finishing in the top ten. Coach John Tucker's top three varsity boys finished in the top ten, led by the Shamrock senior Seth Schenck (17:22.00), winning his second race on the year followed with Zach Grater (9) and Dominick Pataky (10). With Districts less than three weeks away, "I think we are improving but I'm not sure if it is going to be enough by Districts," Tucker said. "Both Linn and Russellville are stacked and even though our top three runners will have no problem being in the top five to eight at Districts, we need our fourth and fifth to step up if we are going to advance as a team." Schenck is having a career season, finishing in the top three at every race thus far and picked up his first win of the season earlier this month at Warrenton. 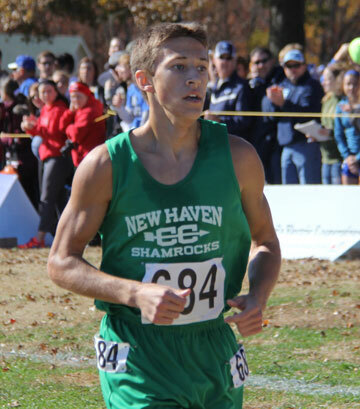 In his first year running cross country sophomore Kevin McDowell ran 19:39 and could end up playing a big role in how New Haven does come district time. Linn, Mo. 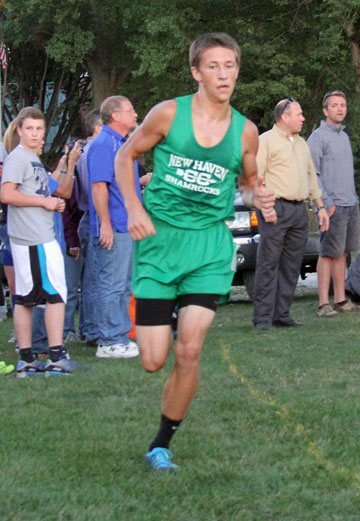 - In past years New Haven has not had a full boy's team of seven runners with the potential of being competitive but after their performance on Saturday it looks to be an exciting season for Coach John Tucker and his team. 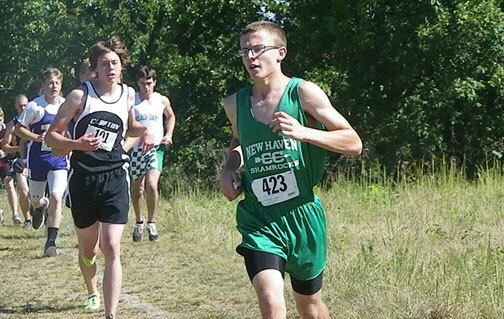 Seth Schenck's "beastness" has carried over from track and into his senior year of cross country. New Haven, Mo. - Going into Saturday's Cross Country season’s opening meet, Coach John Tucker was more optimistic about his team overall than in past years. Tucker’s excitement stems from being able to field a Varsity and Junior Varsity boys’ team and for the first time in 13 years New Haven will also have a Varsity girls’ team.